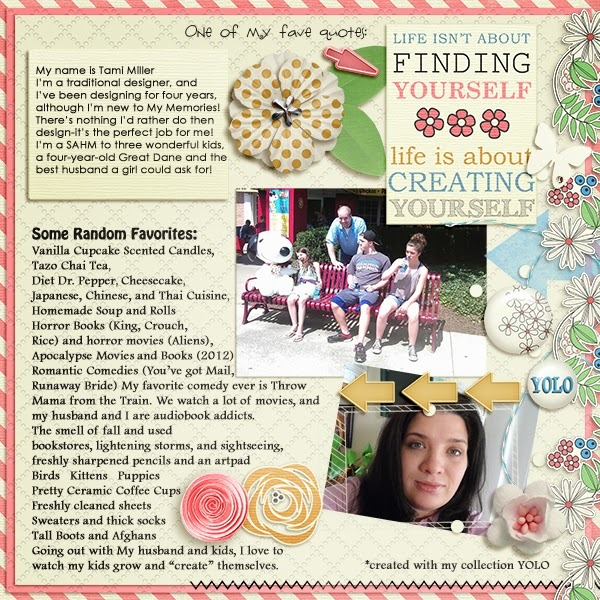 MyMemories Blog: Meet today's Daily Designer....Tami Miller Designs! Meet today's Daily Designer....Tami Miller Designs! Hi, My name is Tami Miller and I'm a new designer here at My Memories. I have been designing for four years-and I've loved it more then any job I've ever had! I love being able to stay home with my kids-and I love creating graphics that help others make their memories beautiful! I've listed some random favorite things on my layout-and their is a photo of my beautiful kids and husband, as well. They are my greatest achievement. My favorite memories are of my wedding day, the births of my three children, and the first time I saw the ocean. My most embarrassing moment was when I was in the first grade we had to perform a square dance in front of the entire school, and our parents. We had to step out of the dance to make room for other students. I stepped out of the dance, over an air vent in the floor, and my dress went above my head! For the rest of the year everyone called me Marilyn Monroe. That is the most embarrassed I can ever remember being. Thanks for reading, and for visiting my page and I hope to get to know more of you here at My Memories. Visit Tami Miller Designs at these social sites! Shop Tami Miller Designs in the MyMemories Design Shop and enjoy 40% off!